June:5th Copthorne & District Silver Band; 12th Mid Sussex Youth Band,; 19th Copthorne & District Silver Band; 26th Horsham Borough Silver Band. 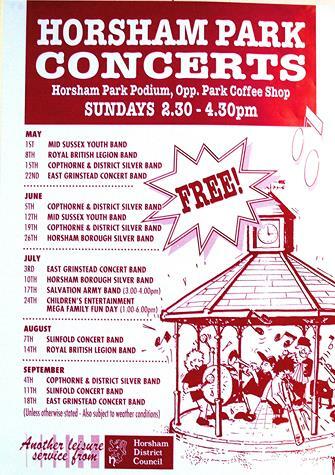 August:7th Slinfold Concert Band; 14th Royal British Legion Band, September; 4th Copthorne & District Silver Band; 11th Slinfold Concert Band; 18th East Grinstead Concert Band. Another Leisure Service from Horsham District Council.